This Easter week I had the pleasure of making my first ever batch of homemade hot cross buns - with a colourful twist! I love baking, but had never thought of making hot cross buns before, always seeming to find myself focusing on the sweet stuff like cupcakes and larger cakes, so it was lovely to have a change and mix things up a bit - quite literally! 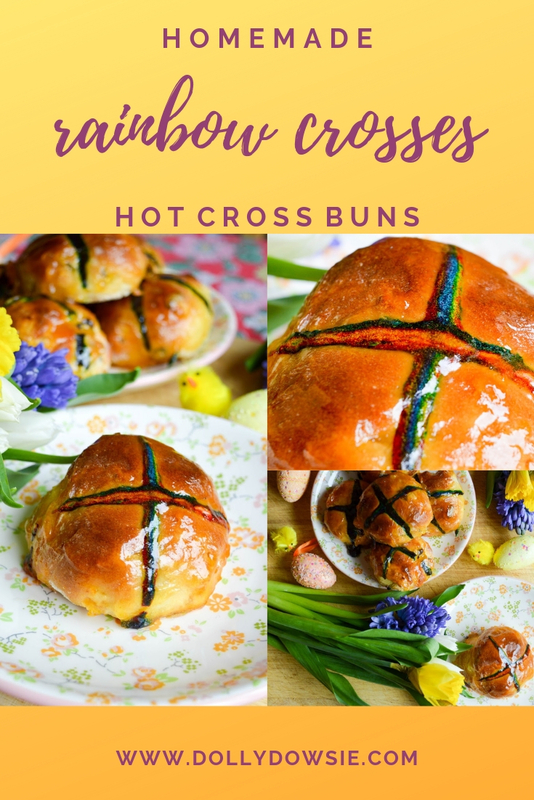 I was invited by Oven Pride to take part in their #HotCrossPride challenge to give my own, creative twist to a classic hot cross bun recipe and I decided to go for colourful crosses to appeal to the kids. 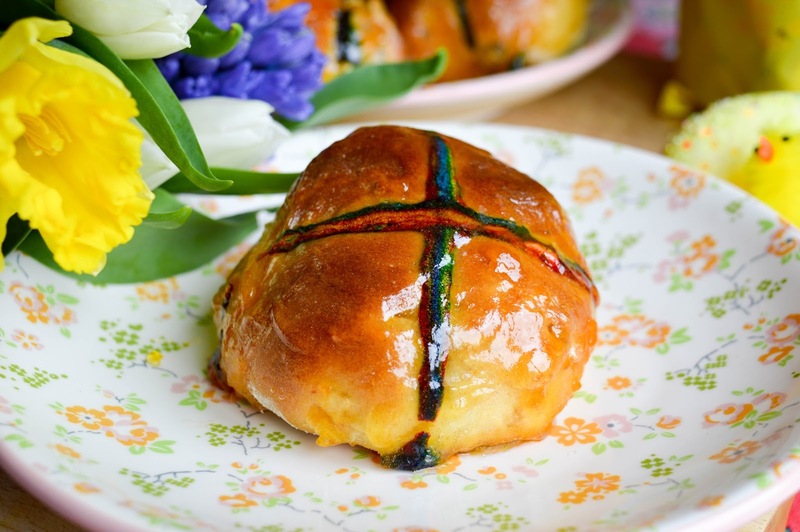 I thought this would make a nice change from the usual yellowy cross that appears on all hot cross buns and I knew that my eldest boy would especially love a bun that had a variety of colours on them. I also used raisins instead of sultanas as my eldest boy loves raisins and I used a clementine for the zest instead of an orange as I think it's sweeter. I also left out the cinnamon as I wanted the fruit to be the main flavour of the buns. Now I have to admit, making homemade hot cross buns is no quick feat and I felt like I was on Bake Off waiting for my dough to proof for a total of three hours, but my creations were most definitely worth the wait and there's something so wholesome about serving up a plate of homemade treats for my family, instead of something shop bought. 1. Bring the milk to the boil, remove from the heat and then add the butter. Leave it to melt in and cool to hand temperature. 2. Put the flour, salt, caster sugar and yeast into a bowl, making a well in the centre. Pour in the warm milk and butter mixture, then add the egg. Mix together with a wooden spoon, then use your hands to mix until you have a sticky dough. 3. Tip the mixture onto a lightly floured surface and need for five minutes until smooth and elastic. Put the dough in a bowl, cover with clingfilm and leave to proof in a warm place for 1 hour. 4. With the dough still in the bowl, add in the mixed peel, raisins, clementine zest and chopped apple. Mix it through the dough with your hands, making sure it's distributed evenly throughout. Leave to proof for another hour. 5. After the hour, divide the dough into 15 pieces and roll each piece into a ball shape on a lightly floured surface. Arrange the buns onto baking trays lined with parchment paper, giving enough space for each bun to rise whilst baking. Cover (but don't wrap) with more clingfilm and set aside for another hour. 6. Heat over to 200 degrees/gas mark 7. Mix the plain flower with 5tbsp of water and separate your food colouring mixtures into separate bowls. Spoon each colour into a piping bag one after the other to create the 'rainbow' effectand pipe a line on each direction in the middle of the bun to create a cross. Bake for 20 minutes until golden brown. 7. Heat the apricot jam to melt. While the jam is warm, brush it over the top of the warm buns and leave to cool. Then serve and enjoy your yummy and colourful Easter treat! Thanks to Oven Pride's hob cleaner, my hob was a breeze to clean - thank goodness as they was gloopy coloured flour all over it after my creations were ready! I really must try to be a neater baker and clean as I go. I love to see the hob gleaming again and with the Hob Pride cleaner it really was a doddle to make it sparkle again. Check out the #HotCrossPride hashtag on Facebook, Twitter and Instagram to see what my fellow baking bloggers were making! These look fab! I love hot cross buns but have never tried to make them myself. I've heard that hot cross buns are pretty good. I haven't had them yet, but they do look good! Thanks for sharing! What a creative dish to make. I have a list of things that I will be cooking tomorrow, but I failed to include pastries. i bought a pie. I like this recipe idea. These rolls looks so delicious. They look so easy to make too, I cant wait to try them. My grandmother used to make these every Good Friday. They were always so good. Yours are very cute. I would love to make these soon. These are adorable! I have never eaten a hot cross bun, but I know how to play the song on a couple of different instruments! Looks so delicious! I love hot bun, homemade is better! Can't wait to try this recipe! 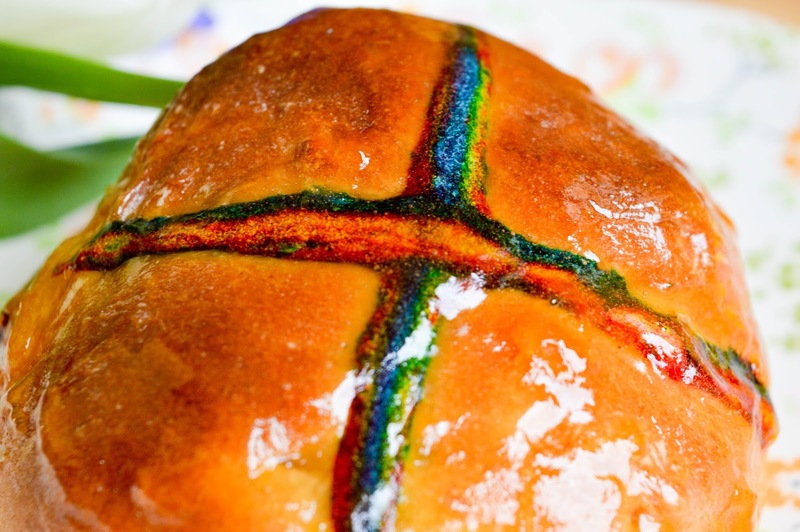 The rainbow cross on the bread looks like such a great idea. I will have to do this soon. 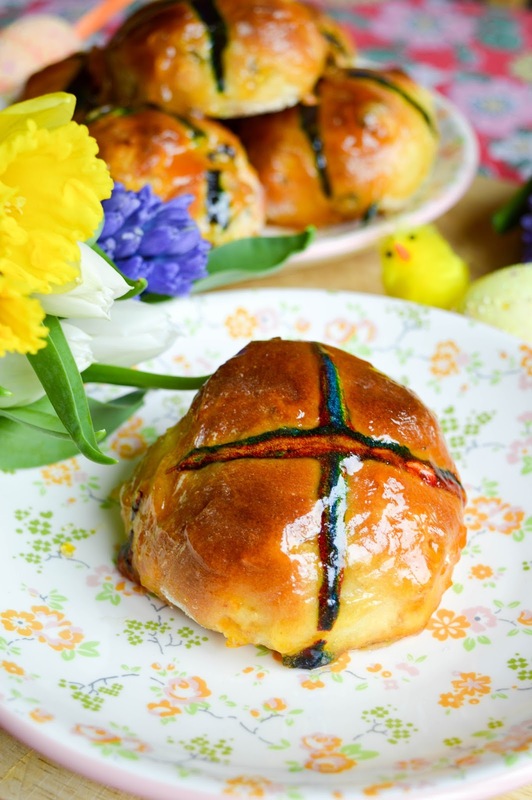 These rainbow hot cross buns looks amazing. I have never made hot cross buns before so I will have to make these. The rainbow crosses are awesome. Thanks for sharing recipe. 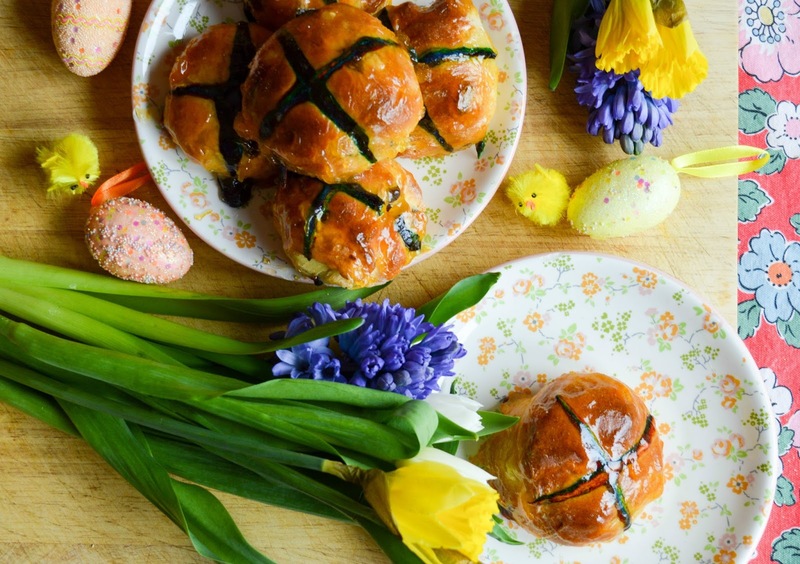 Baking and cooking involves art and these hot cross buns you made is a great example. That looks so delicious. I could eat 2 of those with hot tea yumm! Wow those buns looks absolutely good! I love eating hot buns especially with coffee or hot chocolate. 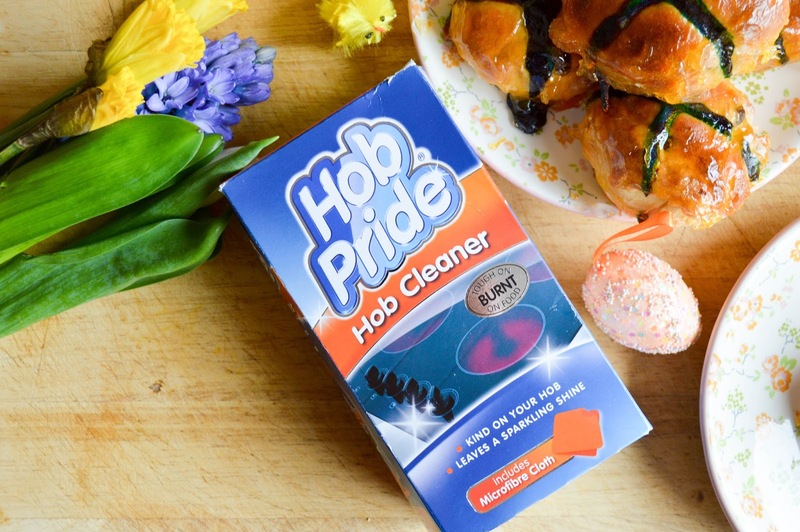 Hob Pride cleaner sounds really incredible! That looks so good. It's making me hungry right now. Thanks for sharing the recipe. I've never had hot cross buns before. However, these look absolutely yummy! These look soooo good! I love hot cross buns but have never tried to make them! My neighbor dropped some off on Saturday! I have not tried any hot cross buns before. I'll bake one when I have the time soon.